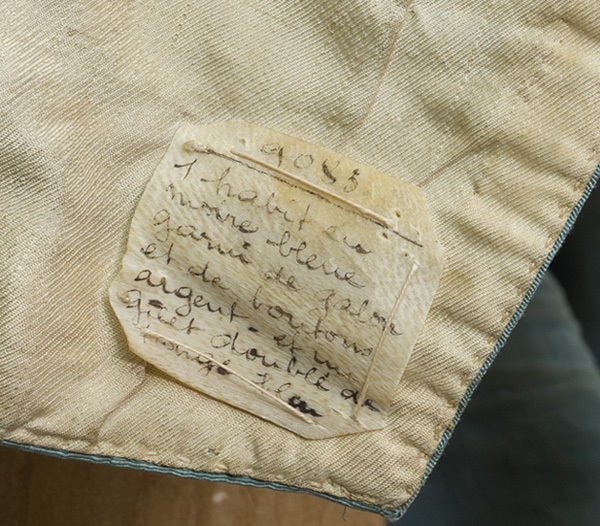 This ensemble from a French collection has an inventory description written in French and handsewn onto the lower front corner of the coat. 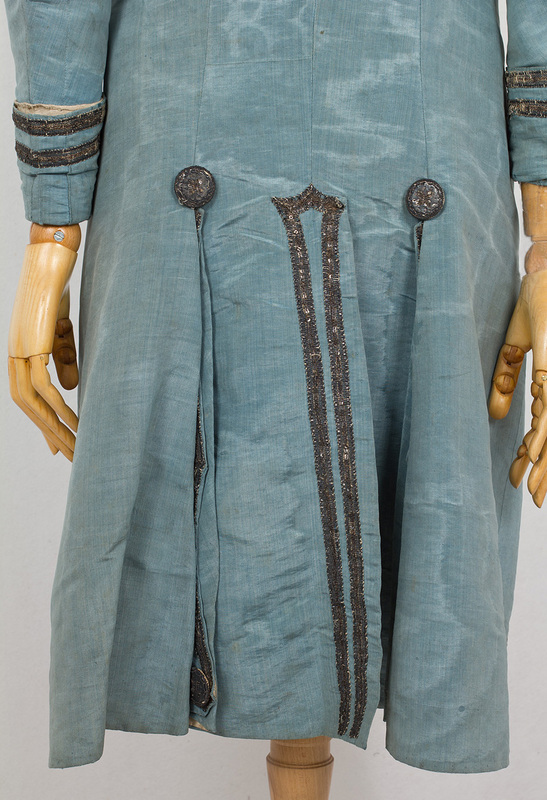 It states that the fabric is blue moiré silk with silver braid trim and silver buttons. 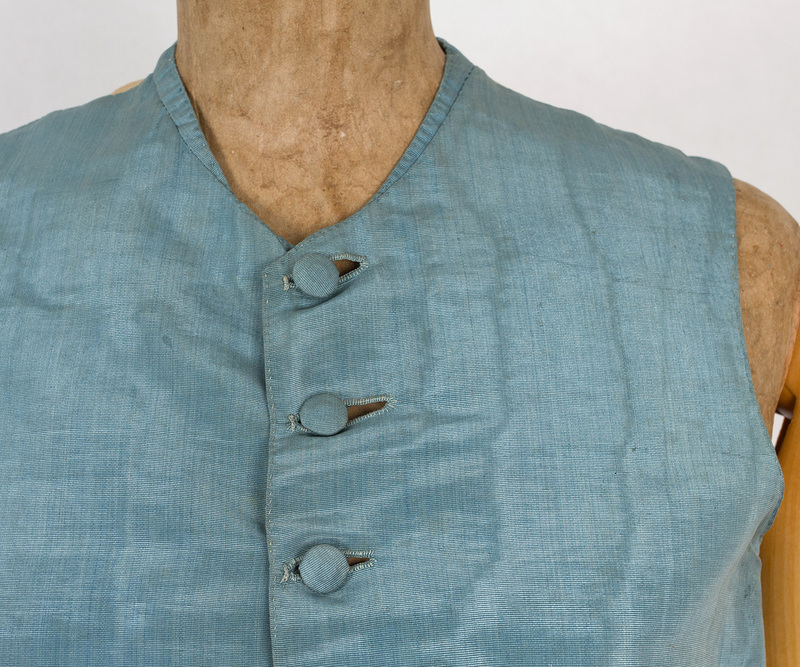 What a treat to find an 18th century garment with the original buttons and trim! 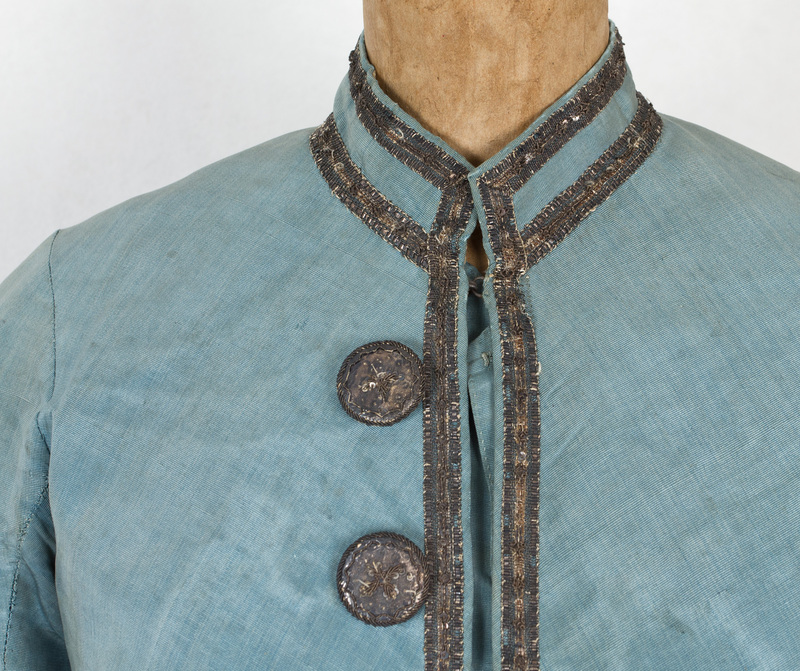 The coat buttons are decorated with bullion couched embroidery and with tiny sequins. I presume from the description that the button trim is silver, although the trim is now tarnished to near black. Judging by the small size, our coat and waistcoat probably belonged to a young man or boy. The cuffs and sleeves of the coat were let out at a later date, perhaps as the boy grew up. 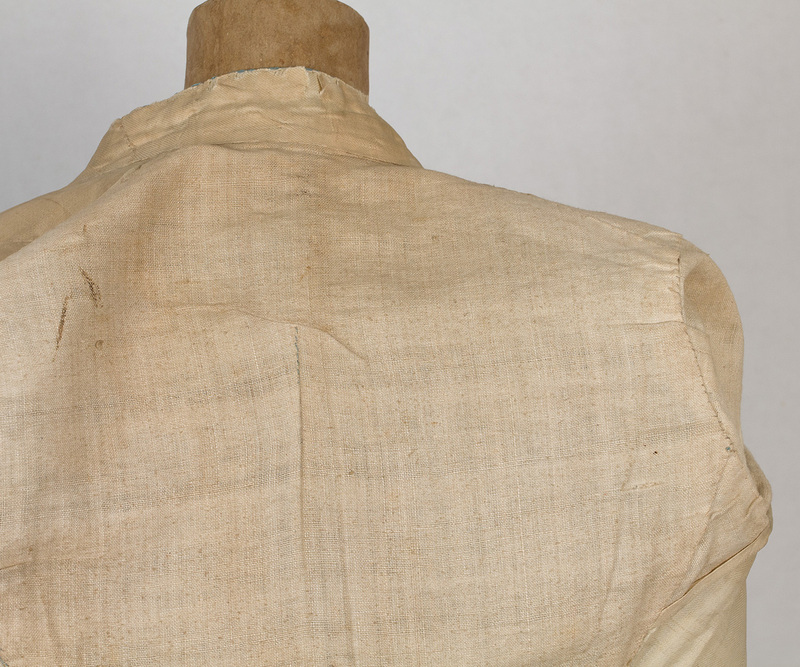 The center-back of the coat is lined with sturdy linen. The fronts and skirt are lined with sateen twill. 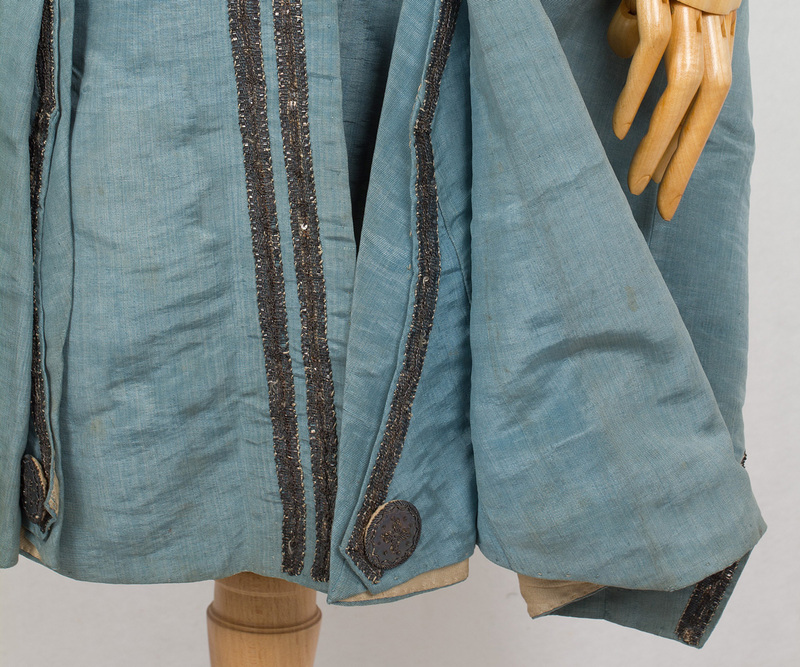 The coat has deep interior pockets and a pleated back skirt vent. 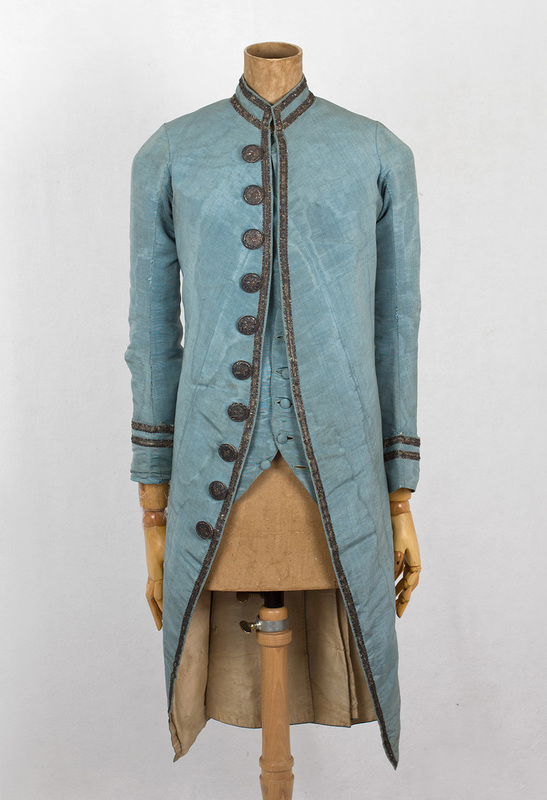 The coat closes in front with two concealed hooks behind the decorative buttons. 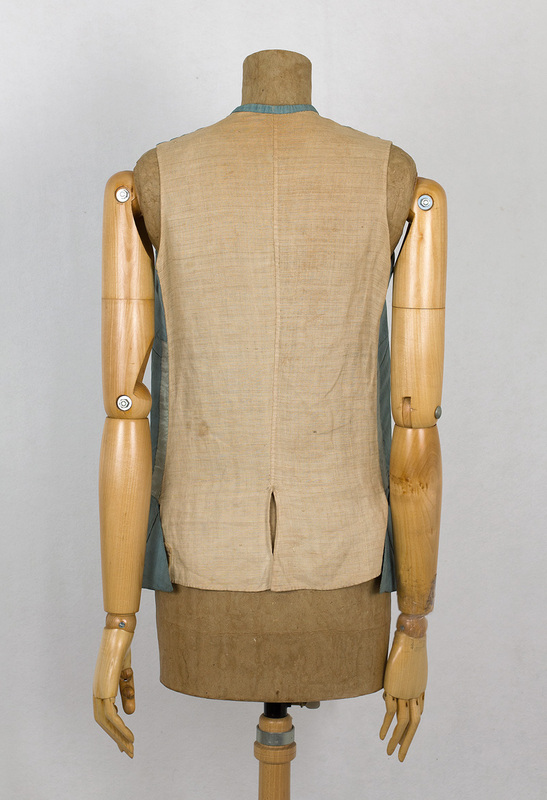 The waistcoat back is of linen. 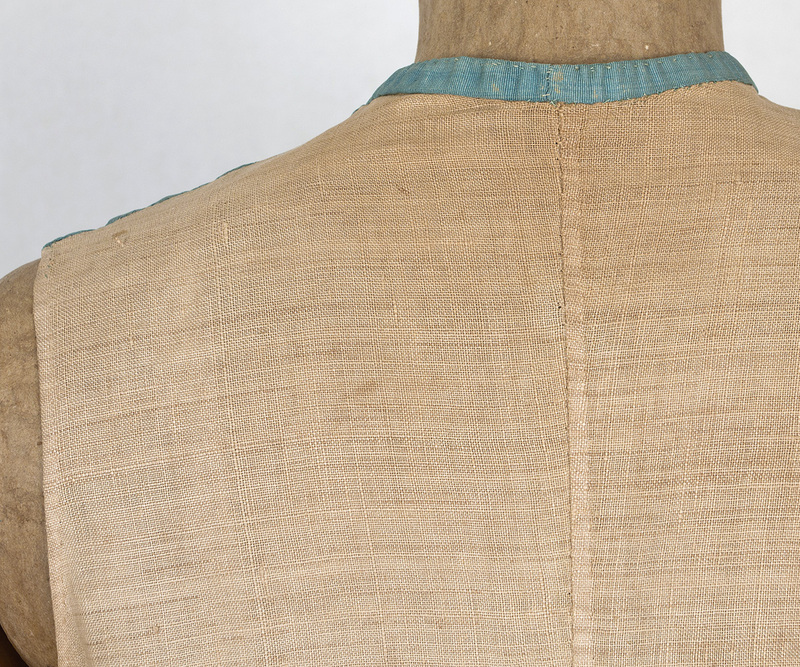 The fronts are lined with blue silk. 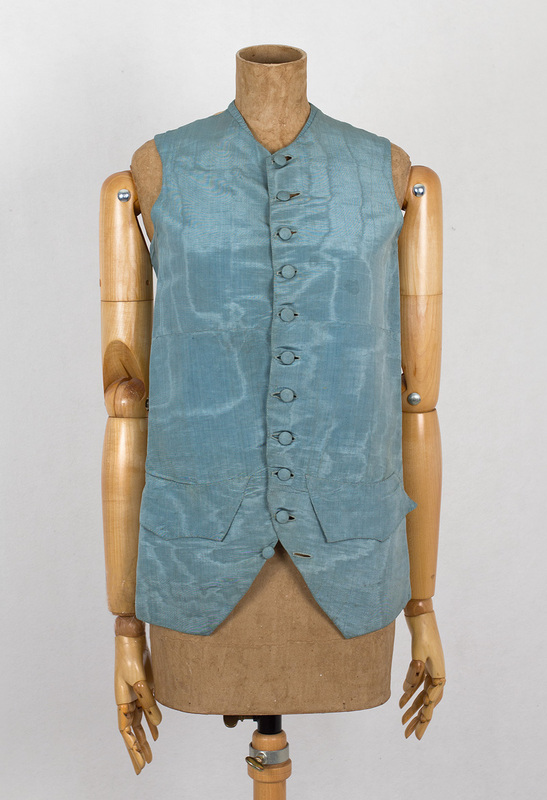 The waistcoat has two set-in pockets with flaps and closes in front with small self-covered silk buttons. The condition is very good. The ensemble is sturdy with no shattering and displays beautifully. 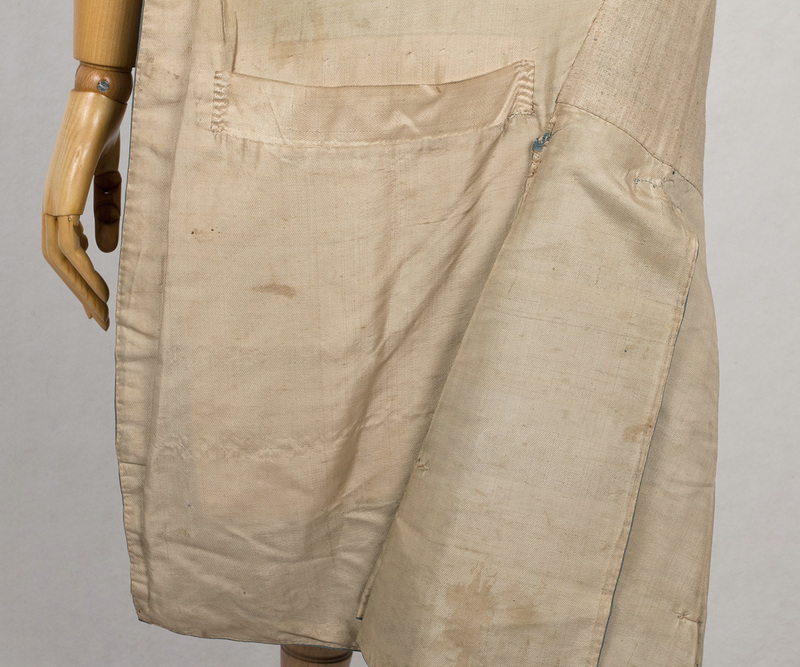 The underarms of both coat and waistcoat are lightly stained. In the fabric of the coat are a few small breaks. 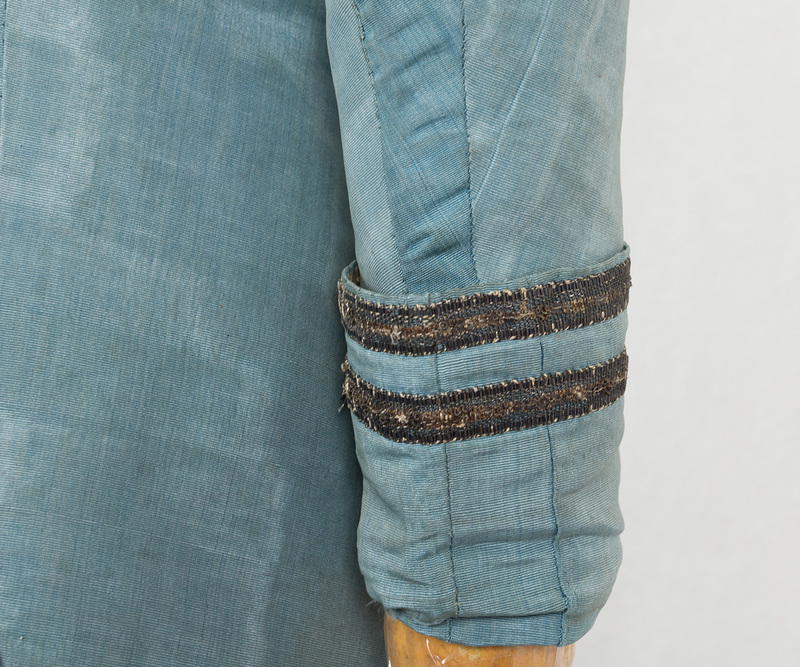 The coat lining has a hole near one of the pockets and slight fraying at the back of the collar. These minor problems, which do not spoil the integrity of the piece, are reflected in the price. 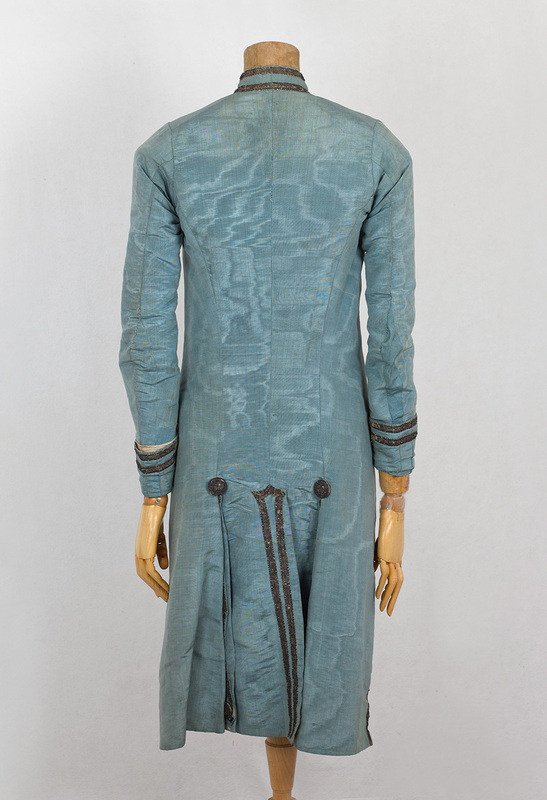 In Excellent condition, the ensemble would go for $4,100-$4,300. 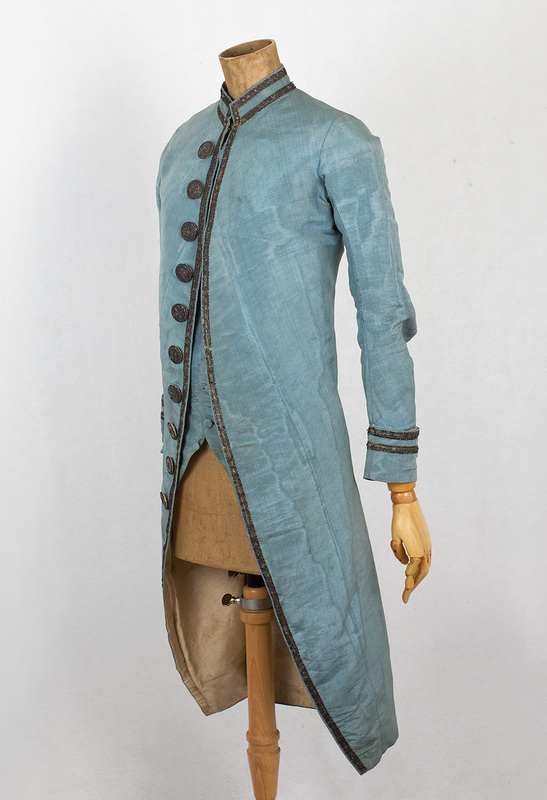 The coat measures: 34" chest; 31" waist; 13" from shoulder seam to shoulder seam; 23" sleeve length; and 42" from shoulder to front hem. 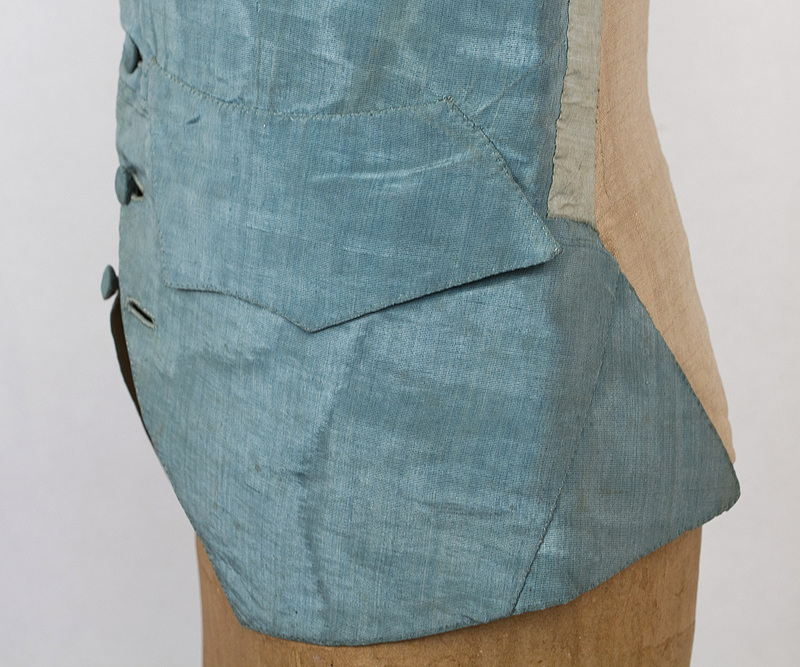 The waistcoat measures: 34" chest; 31" waist; and 25" from the shoulder to the point of the front hem.